791 sets between April 1944 and April 1945. Also known as AIA-1, the AN/APS-6 airborne radar was a simplification of AN/APS-4 (ASH) suitable for single-seat fighters. 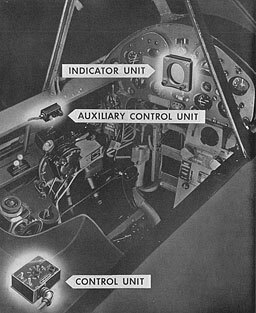 It used a much smaller display, just 2 inches (5 cm) in diameter, which eliminated the need for a radar operator and served as a radar gunsight. The parabolic antenna rotated at 1200 rotations per minute; in search mode, the antenna nodded while rotating to scan a spiral pattern coveringa 120 degree cone in front of the aircraft. In gunsight mode, the nodding was turned off and the antenna scanned a 15 degree cone in front of the aircraft. Search ranges could be set for 1, 5, 25, or 65 miles (1.6, 8, 40, and 105 km), and the scope mode automatically changed for each range setting: The scope operated as a B scope at the two long range search settings or as an O scope at the two shorter search ranges. The scope also provided approximate altitude information from the sea return. The prototype was developed in September 1943, but difficulties with the RF head head delayed production by Westinghouse until April 1944. Almost all the sets produced during the war ended up using the ASD head. Early sets were produced practically by hand, and were so expensive that the night fighter version of the F4U Corsair was nearly double the cost of a conventional Corsair. The effective range proved to be closer to 2 miles than the 3 miles in the design specifications.